Published: Jan 3, 2017 · Modified: Apr 12, 2019 · By Jen Sobjack · This post may contain affiliate links. 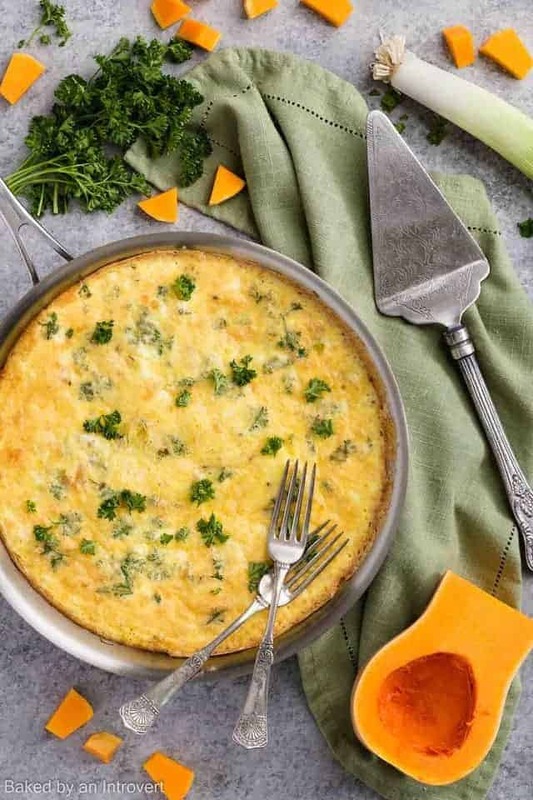 This Leek Frittata with Butternut Squash is an easy breakfast recipe is great for feeding a crowd, as well serving for brunch. With a few simple ingredients, you can have a delicious frittata that’s loaded with flavor. Packed full of leeks and butternut squash for a hearty winter meal, you simply can’t go wrong by serving this to your hungry family. The recipe is simple and begins by cooking the vegetables on the stovetop before pouring an egg, sour cream, and cheese mixture over the top. The frittata goes into the oven to finish cooking until it’s golden and firm. This delicious recipe will come in handy time and time again. As many of you may remember, I’m not a huge fan of breakfast. But, I do love a really good quiche. My favorite is probably this sriracha garlic spinach quiche. It’s loaded with flavor and uber cheesy! And sometimes I’ll munch on a sausage egg breakfast casserole. A frittata is very similar to quiche. Basically, the only difference is a frittata doesn’t have a crust. It’s more like a giant omelet. I figured this is a great way to start my journey to eating better this year. Because we all know that’s the first resolution you have to make at the beginning of a new year. This leek frittata with butternut squash is loaded with winter vegetables. The egg plus vegetables and cheese are enough to hold you over until the next meal. This recipe is so easy too! You simply soften the vegetables in a frying pan then combine the remaining ingredients – eggs, sour cream, Gouda cheese, parsley, salt, and pepper – and pour the mixture over the softened vegetables. It only needs to cook on the stovetop for a couple minutes. Just until the edges begin to set. Then, the entire pan goes into the oven. The frittata takes about 25 minutes to finish cooking in the oven. You need just a handful of ingredients to make a leek frittata! Whisk the eggs, sour cream, parsley, cheese, salt, and pepper together in a large bowl. Gather your ingredients to get started. If you’re looking for more delicious breakfast recipes, try this Zucchini Bacon Quiche, and this Bacon Egg Breakfast Pizza. 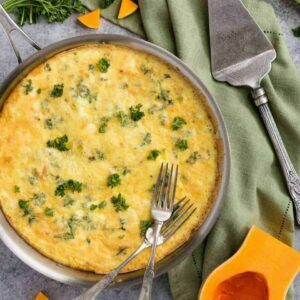 This Leek Frittata with Butternut Squash is an easy breakfast recipe is great for feeding a crowd, as well serving for brunch. With a few simple ingredients, you can have a delicious frittata that’s loaded with flavor. Packed full of leeks and butternut squash for a hearty winter meal, you simply can’t go wrong by serving this to your hungry family. The recipe is simple and begins by cooking the vegetables on the stovetop before pouring an egg, sour cream, and cheese mixture over the top. The frittata goes into the oven to finish cooking until it’s golden and firm. This delicious recipe will come in handy time and time again. Move the oven rack to the upper third position and heat the oven to 350°F. Heat 1 tablespoon of the oil in a 10-inch ovenproof skillet over medium heat. Add the leeks and cook until soften, stirring often, about 5 minutes. Add the squash and cook until softened, stirring often, about 8 minutes. Meanwhile, whisk the eggs, sour cream, and parsley together in a large bowl. Mix in 3/4 cup of the cheese and season with salt and pepper. Turn the heat up to medium-high, add the remaining oil, and pour the egg mixture over the squash. Shake the pan if needed to evenly distribute the mixture. Cook without stirring for about 5 minutes or until the edges begin to set. Sprinkle the remaining cheese over the top and transfer the skillet to the oven. Bake for 25-30 minutes, until golden and the center is set. Cool for 10 minutes on a wire rack before serving. Leftover frittata can be covered tightly and stored in the refrigerator for up to 4 days. 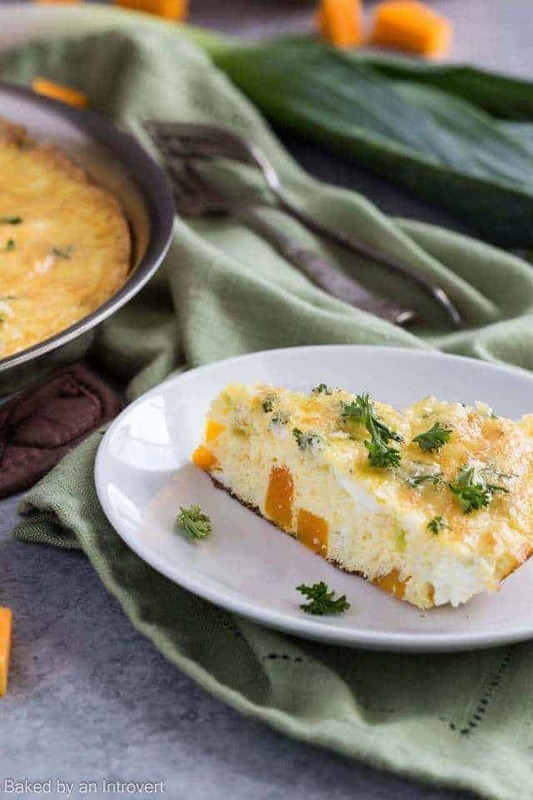 Freeze baked frittata for up to 2 months. Thaw in the refrigerator overnight and bake for 20 minutes at 350°F until heated through. 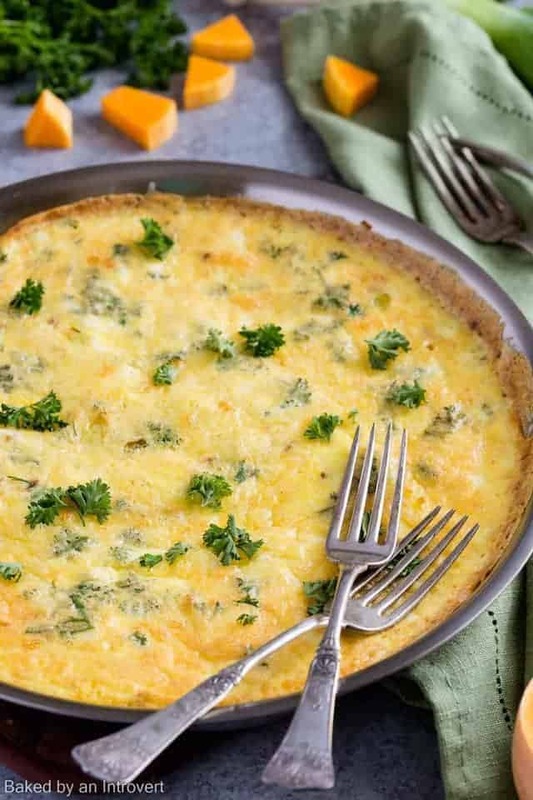 I just love a great frittata, and the ingredients in this would definitely be flavorful! I bet the butternut squash makes it so creamy and tasty! Happy New Year Jen 🙂 This looks like the perfect breakfast to kick off the year!